Cute, soft and full of charm, bunny rabbits are delightful animals! Pet rabbits have so many charming traits. They can make some of the very best pets and be wonderful companions. This is attested to by the thousands upon thousands of people who keep and love bunnies. Hardly anyone can resist these adorable little creatures! Before jumping into getting one or more pet rabbits however, there are a few things you’ll need to learn and understand. Being a good pet keeper is a commitment, but it’s also much more. It takes love and respect for the animal, and a dedication to providing for it… with an environment where it will thrive for its entire lifespan. The real question isn’t “Do Rabbits Make Good Pets?” Perhaps what should be asked is, “Are You a Good Pet Rabbit Keeper?” There are those that will say they are not good pets, and will relay all the challenges they’ve found. But that isn’t usually a fault of the bunnies, but rather something amiss with the keeper’s desire, dedication, or commitment. There are lots of positives, but just like with any pet, there are also some challenges involved in having a pet rabbit. No two bunnies are the same and they seldom follow any exacting behaviors. To be a good pet rabbit keeper, be ready for surprises! Bunnies are wonderfully soft, even softer than a kitten. They are very clean, groom their fur continuously, and are very quiet. Though they are not really cuddly companions, they can be affectionate. They will give nuzzles to your cheek and are very patient with the affections of children. But they will hold their ground with other household pets. Rabbits are entertaining. They have a curious nature and love toys. Each with their own personalities will make you laugh at their antics in more ways than you ever thought possible. They are smart and can be trained to use a litter box. Being great jumpers, some are even trained to enter in jumping competitions! Bunnies make a great “green” pet, they love vegetables! Feeding them hay, rabbit pellets, and green foods is easy and watching them eat is fun and satisfying. Rabbits can live a long time, up to ten years or so. That is a relatively long term commitment, similar to getting a medium sized dog, so think ahead. They need to be given fresh food and water every day. The cage will need to be cleaned regularly or they can be subject to flea and mite infestations. Time outside the cage is also essential for rabbits to exercise and play. The rabbit’s teeth never stop growing. To keep them under control they will need plenty of things to chew on. Rabbits require some grooming, more than a cat, but considerably less than a dog. They don’t need bathing but will benefit from regular nail care and brushing. Regular brushing will help keep the amount of hair around the house down. Trimming their nails keeps them from being quite so destructive around the house if they’re left free to roam around. Vet care is important, as it is for any pet, but it can be expensive and time consuming. With rabbits there can be an additional problem in finding a veterinarian with exotic pet experience, though it is getting easier with so many people keeping them. Spaying and neutering are important. Uterine cancer kills around 65% of unspayed females by the age of five. Aggressive behaviors that come with sexual maturity are also reduced, and may even be totally eliminated. Rabbits need time out of their cage, but can be quite destructive. They love to dig and they may chew almost incessantly. That may be fine outside, but in the house it can be a problem. Rabbit proofing your home will take some thought and effort, and sometimes a moderate expense. You’ll want to devise some protective measures such as covers for the couch and possibly some plastic floor covers. Those electrical cords will also need to covered or kept out of reach. There are a few diseases that rabbits can be prone to, and that may be hard to treat. For example they can’t vomit, and so if they get a hairball it can cause serious intestinal difficulty. Offering the correct diet will help to minimize the odds. Gastrointestinal problems are not universal, but far from uncommon. Gastrointestinal stasis is one of the major issues a rabbit owner has to watch out for. Fly strike and other conditions are equally troublesome. There is also RHD (Rabbit Hemorrhagic Disease) which they may contract. This is a contagious virus that can cause death. Rabbits are among the most fun pets. It’s hard to resist something as gentle and full of life as a pet bunny. 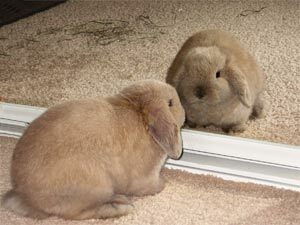 Weigh the factors yourself to decide if you are ready to be a good pet rabbit keeper. Then if you decide to get a bunny, be prepared for fun and surprises! See our list of different types of rabbits that can make good candidates for pets! Photo courtesy of Animal-World.com contributor Sydni on Dr. Jungle’s Pets and Animal Photos: Rabbits.